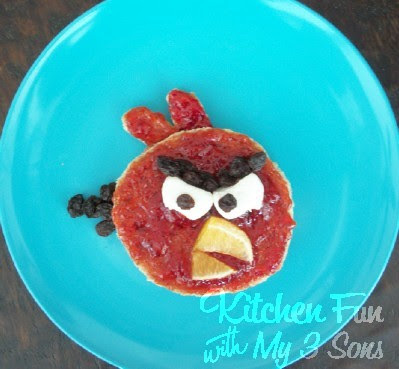 My boys love playing angry birds so we thought it would be cute to make a angry bird lunch. We made this using 2 pieces of whole wheat bread, peanut butter, strawberry jelly, 1 clementine slice, 1 large marshmallow, and raisins. We cut the 2 pieces of bread in a circle. We spread our peanut butter on one piece of bread and put the other slice on top. Put the strawberry jelly on the outside. Cut 2 feathers out of your scrap bread and spread jelly on it for the feathers. Cut a clementine slice to make his beak. Cut a large marshmallow in half to make his eyes. We cut out a bit from the top and the bottom. Add raisins for the eye brows, pupils, and tail. This was so quick and easy to make. Little fans of the angry birds game will love it! 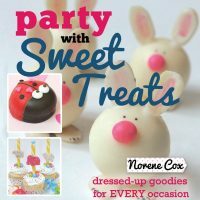 Party With Sweet Treats GIVEAWAY & Book Review! Adorable as usual. Do you seriously come up with these things in the moment, or do you plan it ahead? You are SOOOO creative, I love it!!! Thank you! My boys tell me what they would like and we just make it up as we go most of the time. We use what we have in the house even though things might look a little better if we planned it. I've never played Angry Birds, but this looks really cute. Hilarious! I went through an angry birds addiction. Love this! Who knew something so "angry" could be so cute too! Ha! Ha! Adorable Jill! That is too funny! Looks just like it! Oh my goodness my kids would love this! We will have to make it for lunch sometime soon! Love this! I have 3 little guys who love Angry Birds. Can't wait to suprise them with this. Thanks! So cute, little boys love angry birds! I made some angry bird costumes for some friends and a lady emailed me pics of versions she had made for her little boys. Have a look if you like! So cute! Definitely looking forward to doing this one for the kiddos. Your site is so creative! I'm looking forward to looking around it more; there are so many super cute ideas! That's cool! I hope I can make something like that, such great idea! How fun! My nephew loves Angry birds so I'll have to give it a try. Found you @ Tatertots & Jello's Linky.. glad I did. I saw this on House of Hepworth's linky party, holy cow- love this game and this turned out really cute, what a great idea!! My son loves angry birds!! I will have to make this for him. thanks. We're loving this at Celebrations! I saw this post yesterday morning and made them for breakfast. My kids thought they were the coolest. Thanks for sharing this. 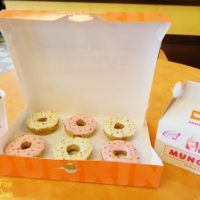 I posted about the sandwiches and linked back to your blog. 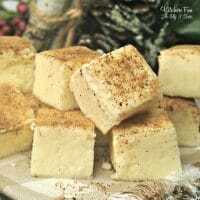 My kids loved these!!! Thanks so much! I'm going to post them and will for sure link back to you! Thanks for another amazing idea!!! My grandson will LOVE this! Thanks!